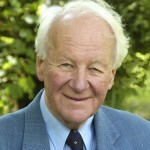 The author of over fifty books on the Christian faith and former Rector of All Souls’, Langham Place, John Stott came to live at the College in 2007. He received many visitors from around the world whose lives he had touched during a truly international ministry. He was founder-director of the London Contemporary Institute for Christian Theology of which he became President in 1986 until his retirement in 1991. It was the privilege of the College of St Barnabas to be John’s home for the last four years of his earthly life. During that time he became a friend to many here and an inspiration to all. He described his move to the College as part of “God’s good provision” for him, and confessed himself thankful for the opportunity to live as part of this community. In his last book, “The Radical Disciple”, written during his time here, John speaks warmly of the College as “a rich Christian community of worship and fellowship, a context congenial to thinking and writing. John generously supported the College’s fundraising with much letter-writing and many introductions. Please join in responding to his request to help us by making a donation in his memory.